Last year, the company introduced the ability to measure customers' faces using the depth-sensing front-facing sensor on the original iPhone X. Now, with three new models sporting the TrueDepth camera, Warby Parker has updated its Glasses app to enable a virtual try-on experience. 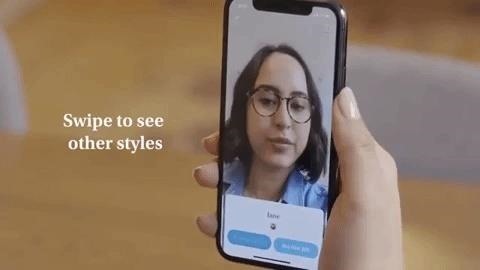 Utilizing the face tracking capabilities of ARKit and the face mapping abilities of the TrueDepth camera, Warby Parker now gives customers a real-time preview of how the company's stylish eyeglasses and sunglasses look in the comfort of their own home. While in the virtual try-on experience, customers can swipe the screen to quickly view a wide range of styles. Once they see something they like, they can mark it as a favorite for purchase. Warby Parker customers (myself included) are likely already familiar with the company's easy try-at-home process, where customers can select up to five styles, receive samples via mail to evaluate, and return the samples to the company. But augmented reality potentially makes that process obsolete, particularly with the face tracking capabilities of the TrueDepth camera paired with ARKit. While customers may need some physical assurance for fit, the updated Glasses app takes the guesswork on how frames look. Aside from Apple-created apps like Animojis and Clips, the TrueDepth camera has not seen much adoption from third-parties. Some standouts include Snapchat, which has adapted its front-facing Lenses for the iPhone X series, and apps like Face Maker and HoloBack from independent developers have demonstrated the creative possibilities for the TrueDepth camera. A truly useful example, such as Warby Parker's Glasses update, could serve as a catalyst for more adoption of the technology.